Control aircraft pushback operations in any direction you want, stop it again at any time and always know the exact location of the aircraft on the airport. On the top left of the screen the current airport name and ICAO code is displayed. Additionally on the top right of the screen you can find the exact location of the aircraft on this airport: It will display the gate or parking position or event the runway the aircraft is currently standing on. You can push the aircraft into all possible directions. 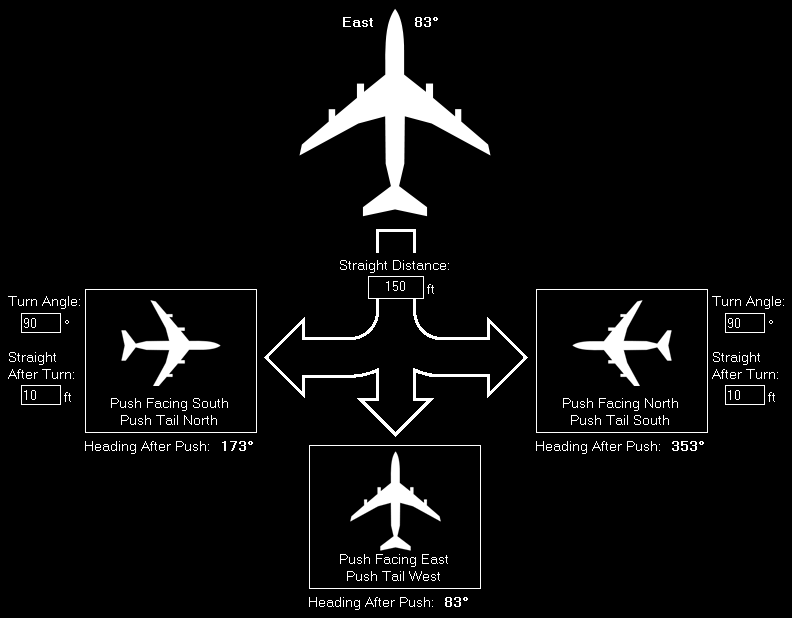 Before starting the pushback operation you can define the distance the aircraft is pushed back. If you push to the left or right you can even define the turn angel and an additional straight distance after the turn has been completed. To start a pushback operation just click on one of the three buttons depending on the direction the aircraft should be pushed to. The program calculates for you the expected aircraft heading after the pushback below the buttons. 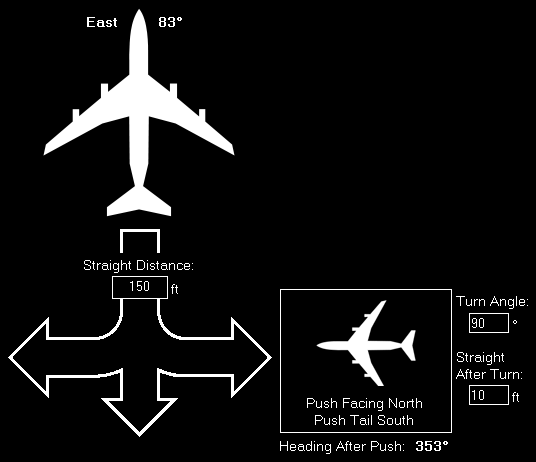 Note: The distances and turn angels are saved in the current aircraft profile or globally if aircraft profiles are disabled. The pushback operation will stop automatically after the defined push distance and in case of pushback to left or right the turn including the additional straight distance after turn has been reached. Of course, you can stop a pushback operation manually at any time by clicking on the button Stop Pushback.